In October 1800, Louisiana was transferred by Spain to France. It was not however, until March 26th. 1803, that the French colonial prefect Laussat, landed at New Orleans, commissioned to prepare for the expected arrival of General Victor, with a large force of French troops. Instead of General Victor, however, a vessel from France brought the news in July that Louisiana had been purchased by the United States. On November 3rd, with troops drawn up in line on the Place d'Armes, and with discharges of artillery, Salcedo, the Spanish governor, in the hall of the Cabildo, delivered the keys of New Orleans to Laussat. On the 20th of the next month, Laussat, with similar ceremonies, turned Louisiana over to Commissioners Claiborne and Wilkinson, and New Orleans became a part of the United States. At that time, with its suburbs, it possessed a population of 24,552 according to the 1810 census and only 3200 of which were Americans, the great majority of the white population being French and Spanish Creoles who hated each other and the newly arriving uncouth Americans. The sugar plantations used large numbers of slaves where there were an average 25 slaves to each white inhabitant. Louisiana had only been an American state 2 years by 1814. By 1814, with the embargo still in effect, the warehouses bulged with goods which the British were eager to seize. The traveler approaching New Orleans by the river in the year 1802, would have discerned at the first glance, what would, have seemed a tolerably compactly built town, facing the levee for a distance of some 1,200 yards from its upper to its lower extremity. From the rue de la Levee (now Decatur street) the town extended in depth (on paper) about 600 yards, although Dauphine street was in reality the limit of the inhabited quarter in that direction. 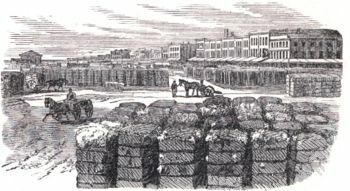 The line of what is now Rampart street was occupied by the palisaded fortification, with a few forts, all in a greater or less condition of dilapidation. At the upper end of the ramparts was Fort St. Louis, and on the ground now known as Congo square, was Fort St. Ferdinand, the chief place for bull and bear fights. Esplanade street was a fortification, beginning at Fort St Ferdinand and ending at its junction with the ramparts on Rampart street. Along what is now Canal street was a moat filled with water, which terminated at a military gate on the Chemin des Tchoupitoulas, near the levee. Thus was the city protected from siege and attack. 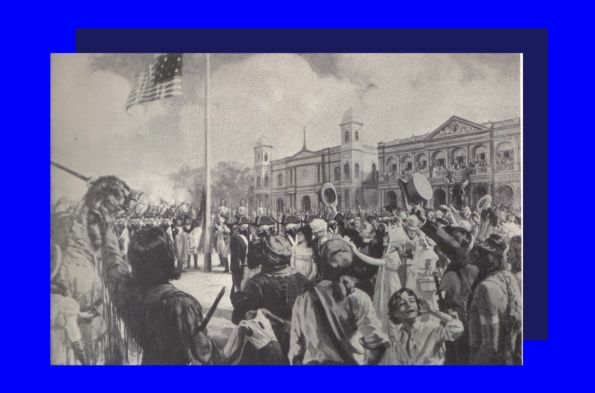 There was no merchants' exchange for the transaction of business, no colonial post-office, no college, no library, public or private, and but one newspaper, the Monitexir de la Louisiane, which, issued once a week. 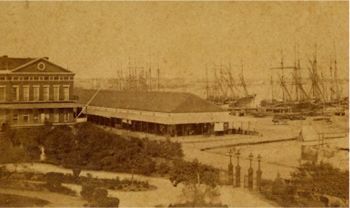 The French Market, the Cathedral, and the Cabildo already existed. The Place d'Armes, now Jackson Square, was used as a review ground for the troops. A wooden gallows stood in the middle of it for several years and public executions took place, the criminals being either shot, or nailed alive in their coffins and then slowly sawed in half. Around the square stretched the leading boutiques and restaurants of the town. Here, on holidays, all the varied, heterogeneous population of the town gathered ; fiery Louisiana Creoles, still carrying rapiers, ready for prompt use at the slightest insult to their jealous honor; Acadians fresh from Canada, rude trappers and hunters. Staid and energetic Germans from "the German coast," with flaxen hair and Teutonic names, but speaking the purest of French, come down to the city for supplies ; haughty Castilian soldiers, clad in the bright uniforms of the Spanish cazadores ; dirty Indians of the Houma and Natchez tribes, some free, some slaves; negroes of every shade and hue from dirty white to deepest black, clad only in shapeless woolen shirts, as little clothing as the somewhat loose ideas of the time and country permitted ; and lastly, the human trash, ex-galley slaves and adventurers, shipped to the colony to be gotten rid of. One of the most disagreeable features of the city in those early days was the condition of the streets in which not a stone had been laid. A wooden drain served for a gutter, the banquette was also of wood, and the street between the sidewalks was alternately a swamp and a mass of stifling dust. Wagons dragged along, with the wheels sunk to the hubs in mud. It was not until 1821 that any systematic attempt was made to pave the streets. Of the ten thousand people, of all ages, sexes and nationalities, who at that time formed the permanent population of New Orleans, about four thousand were white� native, European and American ; three thousand free colored, and the rest slave. In addition to these there were from seven to eight hundred officers and soldiers composing the Spanish garrison, many other Government underlings, and numerous undomiciled foreigners. In the ranks of those not native to the city or the colony were Frenchmen, Spaniards. English, Americans from the States, Germans, Italians, a few refugees from San Domingo and Martinique, emigrants from the Canaries and a number of Gypsies. The mass of the Frenchmen were small shopkeepers and cultivators of the soil ; the Spaniards were generally in the employment of the Government,the commercial class comprised chiefly the Americans, the English and the Irish ; the Italians were fishermen ; the Canary Islanders or Islenos as they were termed, cultivated vegetable gardens and supplied the market with milk and chickens ; and the gipsies who had been induced to abandon a wandering life, were nearly all musicians or dancers. Of the Americans, some were of the "Kentuk" (Kentucky) element, worthy fellows who came periodically to the city in their flatboats, floating down the river laboriously and bringing with them up-country produce from the banks of the Ohio and the Illinois, and returning on horseback to their distant homes. In New Orleans there was general knowledge of the coming attack, but no positive evidence till Jean Laffite sent his a warning to Governor Claiborne, which he had sent after the British attempted to bribe him into aiding the British cause with 30,000 British pounds and a commission in the British navy on Sept 3, 1814 by Captain Nicholas Lockyer and a Captain McWilliams. In response to the British offer he requested 15 days to sound out his men on the matter, but really to buy time to warn the Americans. There had been false reports of invasion in Louisiana and may have contributed to the lethargy on the part of its citizens to respond to various calls to arms. There had been reports of invasion as early as early as August 12, 1812, when it was falsely reported that the British had landed at La Balize near the mouth of the Mississippi and Gov. Claiborne called out 8 companies of the city militia. 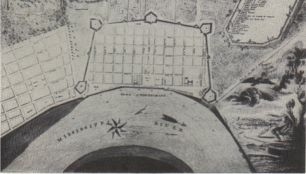 A 1803 plan of New Orleans which showed the city wall and five forts. Jackson quickly found out the decaying city wall defense would not be able to hold off an attack and the city would have to be defended outside its walls. There were four wooden gates to the city, made of pickets, twelve or fifteen feet long and defended by breastworks. 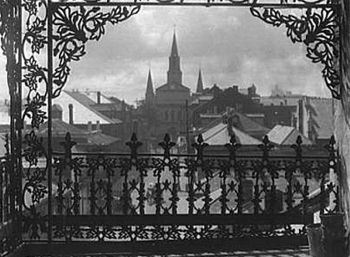 Two were situated on the river bank, at the upper and lower end of Chartres street ; another, Porte St. Jean, at the end of Dumaine street, on the road leading to the lake, and another still higher up. At the early hour of nine these gates were closed, and everybody expected to be at home. Five forts protected this wall two on the river bank, St. Charles and St. Louis, and three in the rear of the city, St. Joseph, St. Ferdinand and Burgundy. These forts were pentagonal in shape, built mostly of brick, and afforded barracks, each for two companies of infantry. They were pierced for sixteen guns, four in the face, three on each flank, and two in the gorge, facing the city, in case the burghers should rise, for whose particular benefit these fortifications were built rather than as a protection against foreign enemies. The fixed fortifications in the New Orleans area at the time of the battle were Fort Petitie Coquilles ( the area later developed into Fort Pike) . Fort St. John, also known as the Old Spanish Fort at the mouth of Bayou St.Charles on Lake Pontchartrain, Fort St. Leon 12 miles below New Orleans on the West bank of the Mississippi at English Turn. This fort had no cannon, rumoured to have been stolen by Lafitte. Fort St. Phillip about sixty miles below New Orleans. This fort was damaged considerably by a hurricane in 1812. There was also a small fortification at La Balize at the mouth of the Mississippi of U.S. artillery. When Jackson arrived in New Orleans on Dec 2nd and established a headquarters at what is now 406 Royal Street, he found a city that was well-nigh defenseless, with petty factions rife divided the leaders and people including the Legislature. The area had not only switched back and forth between France and Spain, the short lived republic of West Florida and the Burr conspiracy and had only been part of America four years. The loyalty of the French and Spanish residents who composed most of the population was circumspect. The French population, with the recent wars with England, were more disposed to ally with the Americans against the traditional enemy, England. The Spanish population was not as well disposed to the Americans as Spain still claimed the area from the east bank of the Mississippi to the Perdido River in Alabama. the West Florida republic affair of 1810, when American filibusters took possession of Baton Rouge and killed the Spanish Commandant did not endear the Americans to the Spanish population. 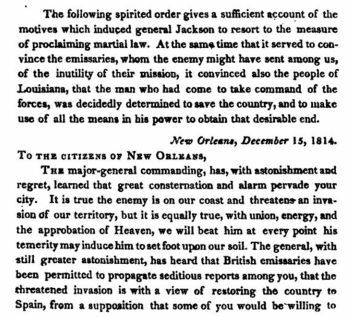 On Dec 8th a grand review of the Louisiana troops was held by Jackson in front of the Cathedral in what is now Jackson Square. The entire city watched a army made up of many divergent races and creeds. Major Plauche's uniformed militia was made up mainly of French and Spanish Creoles, with some Americans from the city; Captain Beale's Rifle Company, mostly Americans. The Louisiana militia, under general Morgan, with the best elements of the country parishes, made up much the same as Plauche's. 300 Men of Color under Major Lacoste and another battalion of men of color, about 250 strong made up of refugees from Santa Domingo under Major Daquin. A small detachment of about 18 Choctaw Indians and the followers of Lafitte. With these an U.S. units Jackson was to take to battle against the best trained army of Europe, if not the world. The Major-general commanding, has, with astonishment and regret, learned that great consternation and alarm pervade your city. It is true the enemy is on our coast and threatens to invade our territory; but it is equally true that, with union, energy, and the approbation of Heaven, we will beat him at every point his temerity may induce him to set foot on our soil. The General, with still greater astonishment, has heard that British emissaries have been permitted to propagate seditious reports among you, that the threatened invasion is with a view to restore the country to Spain, from the supposition that some of you would be willing to return to your ancient government. Believe not such incredible tales; your Government is at peace with Spain. It is the vital enemy of your country,�the common enemy of mankind, the highway robber of the world, that threatens you. He has sent his hirelings among you with this false report, to put you off your guard, that you may fall an easy prey. Then look to your liberties, your property, the chastity of your wives and daughters. 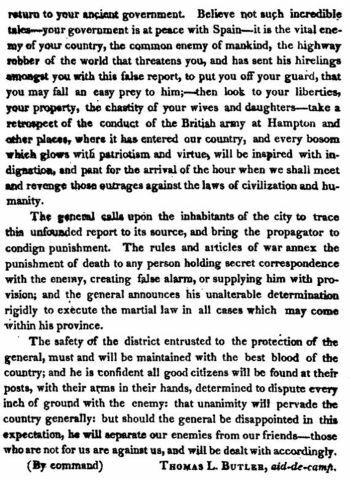 Take a retrospect of the conduct of the British army at Hampton, and other places where it entered our country, and every bosom which glows with patriotism and virtue, will be inspired with indignation, and pant for the arrival of the hour when we shall meet and revenge these outrages against the laws of civilization and humanity. The General calls upon the inhabitants of the city to trace this unfounded report to its source, and bring the propagator to condign punishment. The rules and articles of war annex the punishment of death to any person holding secret correspondence with the enemy, creating false alarm, or supplying him with provision. The General announces his determination rigidly to execute the martial law in all cases which may come within his province. On the night of Jan 7 on the eve of the main battle. 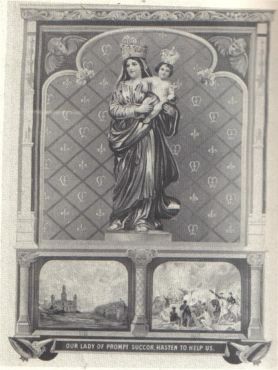 People gathered at the Ursuline Convent to pray for victory under that statue of Our Lady of Prompt Support. Jackson came to the convent after the battle to thank the nuns for their support.